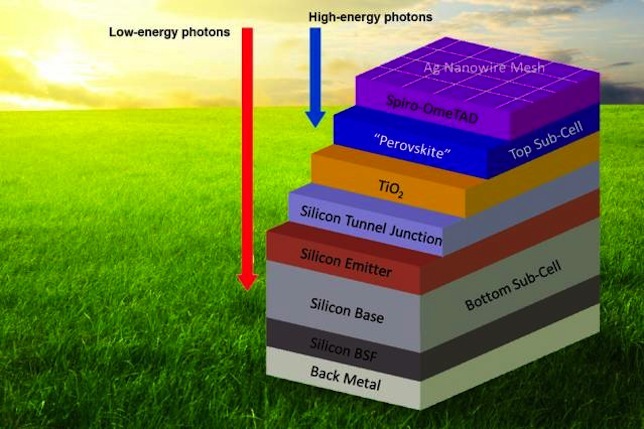 A team of researchers from the Massachusetts Institute of Technology and Stanford University has developed a new two-layered solar cell capable of harvesting a broader range of energy from sunlight. Using a layer of silicon, the material found in most solar panels, the new cells also include a semi-transparent layer of perovskite, which absorbs higher energy light particles. An earlier version of the cell from the same team also used stacked layers of the materials, but required separate circuits for each, whereas the newest version operates on a single circuit. The previous version allowed each layer to be tuned independent of the other to achieve peak performance. The new cells are limited to the capacity of whichever layer is performing most poorly. But the new cells are also easier to build and install, according to Jonathon Mailoa, a graduate student at MIT who worked on the project. "It has advantages in terms of simplicity, because it looks and operates just like a single silicon cell," Mailoa said in a prepared statement. To address the performance limitations of the newer panels, the team plans to match the capacity of the two layers as closely as they can on future attempts. Currently the new cells are 13.7 percent efficient — about the same as normal solar cells — "but the researchers say they have identified low-cost ways of improving this to about 30 percent — a substantial improvement over today's commercial silicon-based solar cells — and they say this technology could ultimately achieve a power efficiency of more than 35 percent," according to an MIT news release. Another challenge for the team is the durability of perovskite, which degrades quickly when exposed to air. The team plans to look into improving the durability of the material or closing it off from the air without lowering efficiency or increasing manufacturing costs. "Our job at this point is to provide options to the world," said Tonio Buonassisi, associate professor of mechanical engineering at MIT, in a prepared statement. "The market will select among them."